Antireflection (AR) coatings on plastics have a multitude of practical applications, including glare reduction on eyeglasses, computer monitors and the display on your smart-phone when outdoors. 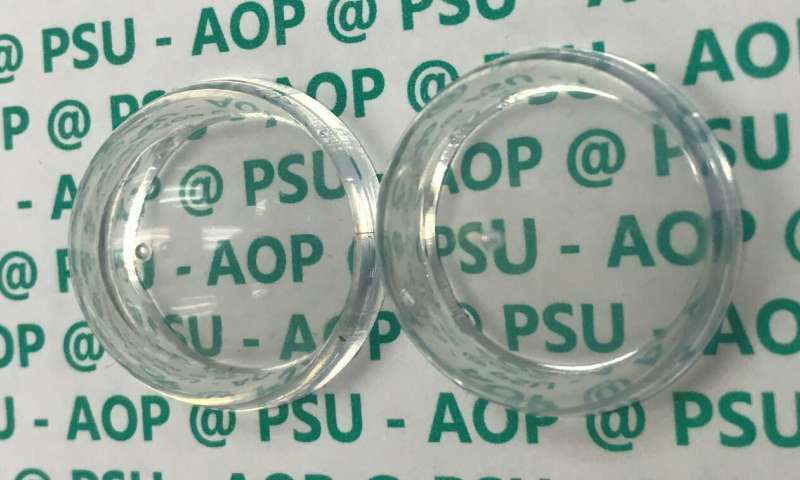 Now, researchers at Penn State have developed an AR coating that improves on existing coatings to the extent that it can make transparent plastics, such as Plexiglas, virtually invisible. "This discovery came about as we were trying to make higher-efficiency solar panels," said Chris Giebink, associate professor of electrical engineering, Penn State. "Our approach involved concentrating light onto small, high-efficiency solar cells using plastic lenses, and we needed to minimize their reflection loss." They needed an antireflection coating that worked well over the entire solar spectrum and at multiple angles as the sun crossed the sky. They also needed a coating that could stand up to weather over long periods of time outdoors. "We would have liked to find an off-the-shelf solution, but there wasn't one that met our performance requirements," he said. "So, we started looking for our own solution." That was a tall order. Although it is comparatively easy to make a coating that will eliminate reflection at a particular wavelength or in a particular direction, one that could fit all their criteria did not exist. For instance, eyeglass AR coatings are targeted to the narrow visible portion of the spectrum. But the solar spectrum is about five times as broad as the visible spectrum, so such a coating would not perform well for a concentrating solar cell system. Reflections occur when light travels from one medium, such as air, into a second medium, in this case plastic. If the difference in their refractive index, which specifies how fast light travels in a particular material, is large—air has a refractive index of 1 and plastic 1.5—then there will be a lot of reflection. The lowest index for a natural coating material such as magnesium fluoride or Teflon is about 1.3. The refractive index can be graded—slowly varied—between 1.3 and 1.5 by blending different materials, but the gap between 1.3 and 1 remains. In a paper recently posted online ahead of print in the journal Nano Letters, Giebink and coauthors describe a new process to bridge the gap between Teflon and air. They used a sacrificial molecule to create nanoscale pores in evaporated Teflon, thereby creating a graded index Teflon-air film that fools light into seeing a smooth transition from 1 to 1.5, eliminating essentially all reflections. "The interesting thing about Teflon, which is a polymer, is when you heat it up in a crucible, the large polymer chains cleave into smaller fragments that are small enough to volatize and send up a vapor flux. When these land on a substrate they can repolymerize and form Teflon," Giebink said. When the sacrificial molecules are added to the flux, the Teflon will reform around the molecules. Dissolving the sacrificial molecules out leaves a nanoporous film that can be graded by adding more pores. "We've been interacting with a number of companies that are looking for improved antireflection coatings for plastic, and some of the applications have been surprising," he said. "They range from eliminating glare from the plastic domes that protect security cameras to eliminating stray reflections inside virtual/augmented -reality headsets." One unexpected application is in high altitude UAVs, or unmanned aerial vehicles. These are planes with giant wingspans that are coated with solar cells. Used primarily for reconnaissance, these planes rely on sunlight to stay in near perpetual flight and so a lot of the light they receive is at a glancing angle where reflections are highest. One of the companies that makes these solar cells is exploring the AR coating to see if it can improve the amount of light harvested by a UAV. Because the technology is compatible with current manufacturing techniques, Giebink believes the coating technology is scalable and widely applicable. At this point, his test samples have stood up to central Pennsylvania weather for two years, with little change in properties. In addition, the coating is also antifogging. "The coating adheres well to different types of plastics, but not glass," he said. "So, it's not going to be useful for your typical rooftop solar panel with a protective glass cover. But if concentrating photovoltaics make a comeback, a critical part of those is the plastic Fresnel lenses, and we could make a difference there." Great stuff! Excellent work. Congratulations are in order. Indeed - what a delicate and interesting approach. Its hard for me to imagine PTFE being tough enough for many outdoor applications, epecially when its surface is not solid, but contains microscopic pores. Solar panels, for instance, have mineral and plant dust, rain, hail etc. to contend with, as well as brushing to clean them.